You know how feedback you give to your reports sometimes goes in one ear and out the other? That team member you spoke to last week, for instance, he just doesn’t seem to have taken on what you said, despite your carefully prepared constructive criticism. Changes you thought you’d agreed, just aren’t happening. It’s as if you’d never given him any feedback in the first place. Frustrating, and deflating too. You really had to psyche yourself up to pass on that tricky feedback, risking a bad vibe between the two of you. And then absolutely zilch happened. I notice in my sessions with third sector managers and leaders that there’s a huge reluctance to see the feedback process as a positive one. Are we such sweet people that we don’t want to critique anyone, even our reports whose learning and development we’re responsible for? We’re certainly super-busy, so it often feels easier to let things pass. And then we save it all up for the annual review, when, of course, there’s far too much to take on board. I believe this is the wrong approach. Feedback, both positive and negative, is not something to be avoided or ‘psyched up for’. Something to be saved up or dispensed out. 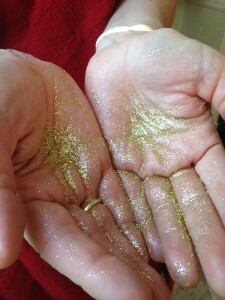 Make it as precious as gold dust, but not as rare. You want to be scattering it over your direct reports whenever possible (actually not quite whenever, but keep reading to find out when not to) so they can be learning in their role every day not just in one-to-ones and performance reviews. By giving great feedback you’re investing in that person and in your organisation. Each thoughtful reflection back to them is a piece of pure gold dust that they can use to shine even brighter, get more done, contribute, and grow. Please don’t save up feedback for annual reviews and monthly one-to-ones. Give lots of positive feedback, and give it immediately. Follow up your more critical feedback within 24 hours. (But make sure it’s given in private, though, and that you’re not nit-picking. A one to five ratio of positive/less positive feedback is about right.) If you’re already used to communicating it shouldn’t be a big deal. Mistakes are, after all, are great learning opportunities. Ask your team member questions such as, “How do you feel your presentation went?” “What could have made it even better, do you think?” “How can I help you to..?” Speak in a spirit of curiosity, so your questions don’t come across as loaded. Listen and be genuinely open to what they have to say. When people come up with their own solutions they are so much more likely to act on them. Talk about behaviour, not character. You’ll want to avoid statements such as “you often come across as rude”. The other person will be be thinking “why? when? In what way?” “In this morning’s meeting, you interrupted people three times,” is much clearer. Remember, you’re helping your report to meet a particular goal and to grow professionally. Feedback is not about ‘having a go’. Ending the conversation on a low builds resentment and undermines motivation. The old hamburger or sandwich approach still works beautifully. Positive point, something to change, positive point. An acknowledgement that you have some responsibility too e.g. “I know there’s a bit of a culture here of being late to meetings. We’ve all done it, including me,” goes a long way to making the ‘bad news’ easier to hear. Before you wind up, make sure you both know what changes are expected and have a follow-up date agreed to check in with progress. So, do you find yourself avoiding giving feedback? Or perhaps you’ve cracked how to do it? Maybe you’ve been on the receiving end of poorly delivered feedback? Please do share your experiences and tips here. Giving gold dust feedback that helps your reports to shine is one of the skills I help develop in middle and senior managers through my one-to-one coaching. If you want to get your feedback across more powerfully click here to book an initial no-obligation chat.